Qualify For Front Row Alice In Chains Tickets For The Sold Out Civic Center Show! Yep, we like to say that we are your Number ONE Rock station for the concerts. In case you haven’t noticed, 2019 is already off and running with amazing nut-tingling Rock shows here in Central Illinois. 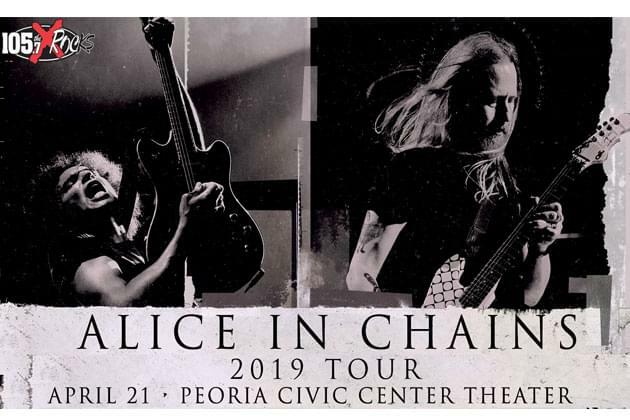 ALICE IN CHAINS is SOLD OUT, for our April 21st show at the Peoria Civic Center Theater with National Shows 2, but, guess what? We have TWO PAIRS of last chance, FRONT ROW tickets just for you! Say what? Yep, listen to the X at 7am, 9am, Noon, and 3pm, for our “Trigger to call”, to qualify YOU for one of two pairs of front row tickets to the show! Just dial us at 309-495-9496, or 877-495-9496! And then, on APRIL 18th, at roughly 5:25pm, Anna Kinkade will randomly draw TWO names from all of our qualifiers, to win the tickets! It’s that easy! It’s time to ROCK with one of the greatest bands ever, ALICE IN CHAINS!! Good luck!